And that end result is worth waiting for. Take the recipe for aligot, for example, ‘a mix between mashed potato and fondue. You whip in a lot of cheese and mash and it’s fabulous. I have it with good quality sausages – or just more cheese,’ she giggles. Because aside from being a highly skilled chef, Gizzi is above all a total, downright foodie. ‘I just love delicious food. It’s not about being snobby, it’s about the pleasure of what you’re eating,’ she says. It’s there for all to see on her Instagram feed, which is flooded with pictures of proper meals i.e. not only the clean, green dishes we’ve come to expect) from home, restaurants and her travels. 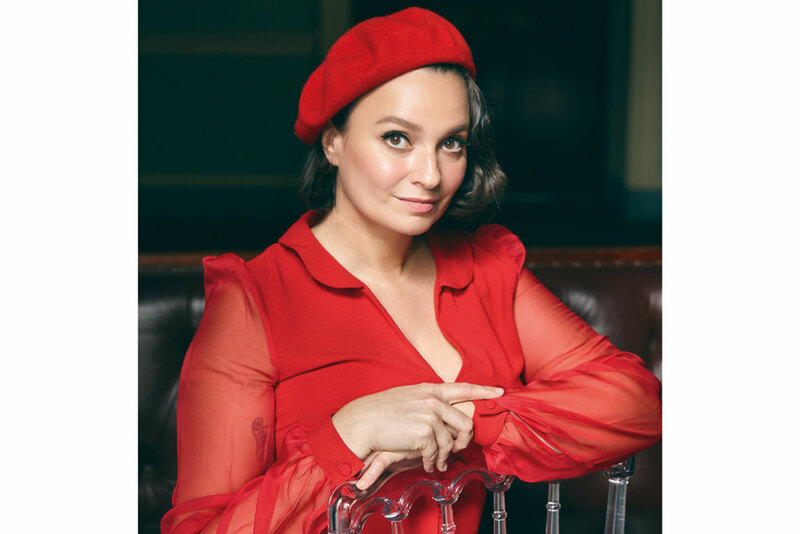 Gizzi has always admitted to being more ‘healthy appetite’ than ‘healthy eating’, a refreshing attitude amid the unrealistic standards of Instagram – nor is it just a popularity ploy, but an outlook she adopted from the beginning. ‘I am against eating skinny. My way was always about humour and the fact that you can eat well and still be conscious of what you eat and have a balanced diet,’ she says of Eat Yourself Skinny, the series that shot her to fame. 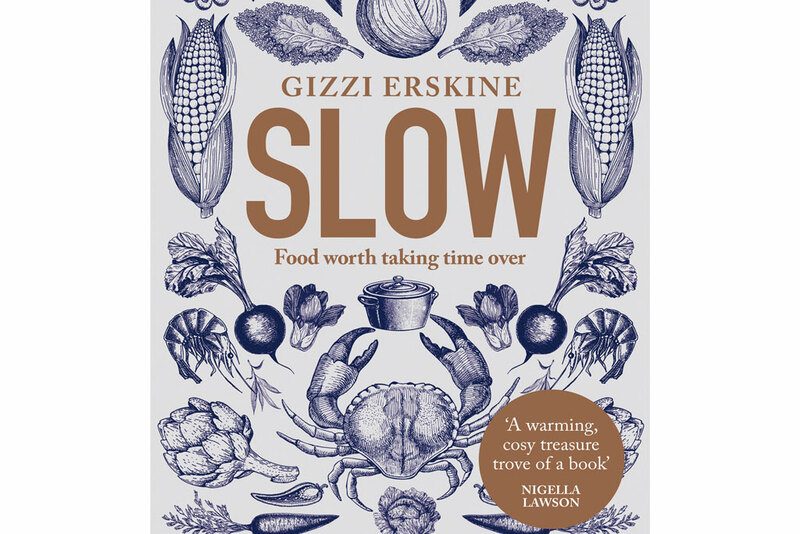 In an era that values convenience over quality, it’s also hard to find the time to fit the slow food approach into our everyday lives, and Gizzi is not under any illusions that spending three hours a night cooking is viable for most people. She certainly doesn’t always practice what she preaches. ‘On a normal night after work I would probably have a really good tomato salad or a plate of cheese with wine, but over the last few years it has made me want to cook properly on my days off in a different way.’ She does advise putting aside the odd weekday evening or weekend afternoon to cook the perfect ragù or stew, pouring love and care into it – believing both mind and body will reap the benefits. 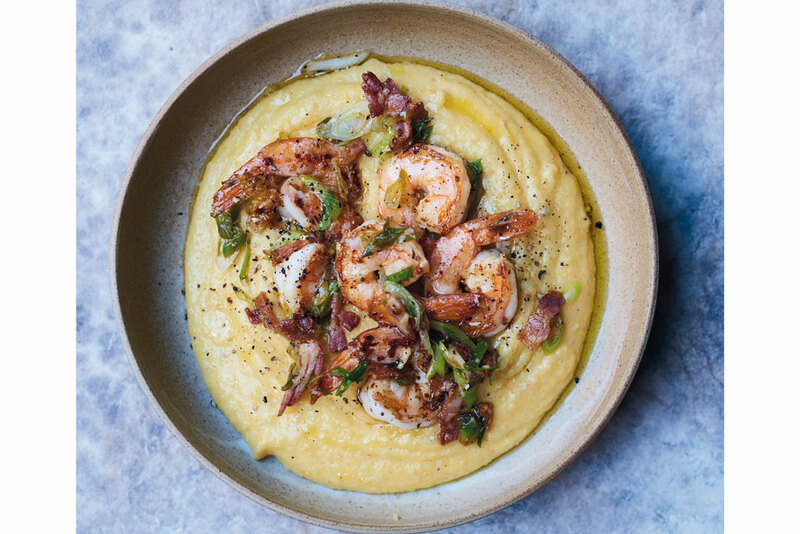 Place the prawns in a bowl with enough olive oil to coat them, add the crushed garlic and allow to marinate while you get everything else ready. This dish cooks fast so have everything prepped and organised before you start cooking. Heat a frying pan over a medium heat with a slick of oil. Add the bacon and fry until it is starting to crisp and the fat has rendered. Remove the bacon from the pan with a slotted spoon and set aside. In the same pan, melt the butter in the remaining bacon fat. Turn up the heat to high and add the prawns. You want to cook these hard and fast. When they have begun to turn opaque, return the bacon to the pan along with the spring onions, salt, pepper and cayenne. Check for seasoning and give it a generous squeeze of lemon juice before serving alongside polenta or aligot. Preheat the oven to 180˚C/160˚C fan/gas mark 4. Heat a good lug of the oil or clarified butter in a large heavy-based, lidded casserole. Season the chicken pieces with the salt and pepper and brown them in two batches. Cook for four minutes on each side and set aside. Add some more oil to the pan, and place the garlic bulb halves face down for a few minutes until they begin to caramelise. Next, throw in the shallots and cook in the chicken juices for 30 minutes. Scrape the bottom of the pan to remove all the delicious chicken residue. Add the tomato purée and flour and cook for a few minutes. Return the chicken pieces to the pan. Now you need to flambé! The easiest way to do this is to put half the brandy into a metal ladle, and the rest into the casserole. Set the brandy in the ladle alight and pour it over the chicken. Allow the flame to die down. Next, pour in the wine and the stock, then add the bay leaves and thyme sprigs. Season well with salt and pepper. Put the lid on the casserole and place in the oven for one hour. 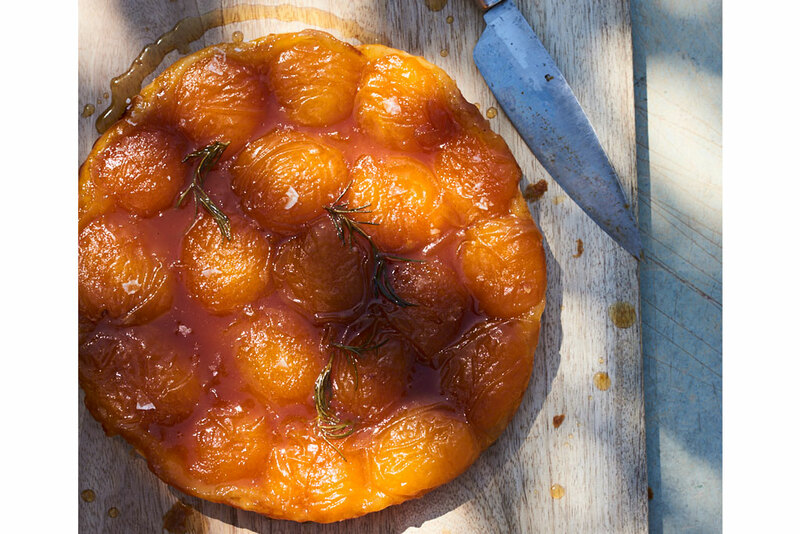 Once the cooking time is up, remove from the oven and stir in the sugar and vinegar. 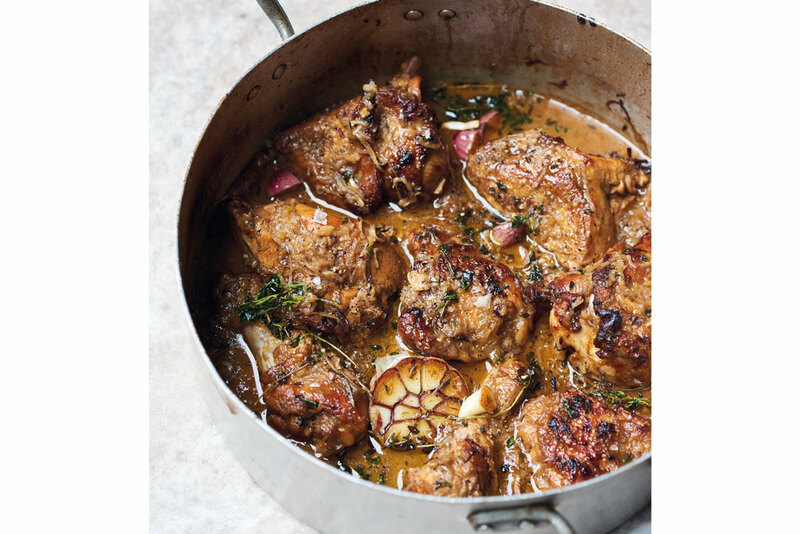 This might sound a bit unusual, but trust me, it really elevates the flavours of the stew. Serve with mashed potatoes and greens.